Used to visualise the various stakeholders and to get them thinking about priorities. This is possibly the most important column on the board. 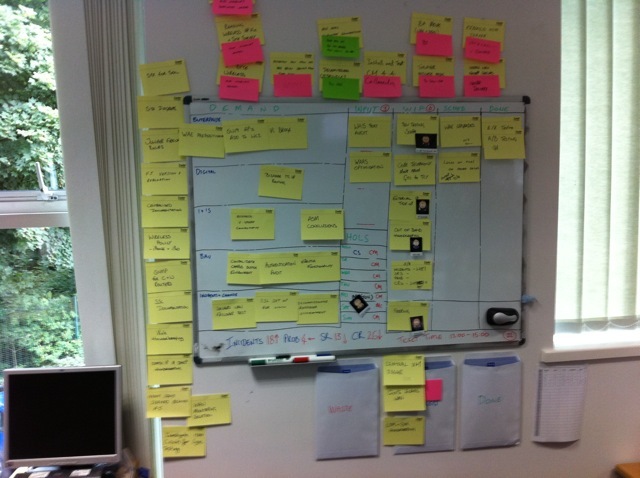 This column drives out the prioritisation conversation with stakeholders and provides protection for the delivery team. It forces conversations that used to be avoided and often pushed onto the delivery team to prioritise. Team members pull work from the Input column only when they are ready to do so. If they get blocked on a piece of work then they first focus on unblocking the issue or assist other team members with their tasks. Once a piece of work has been done it often has to wait for a scheduled maintenance window (often out of hours) before it can be deployed and put live. This column is kind of a waiting for release column and used to plan maintenance windows. The section directly above the board with lots of cards with magenta post-its on it is the long term blockers area. This team deals with many 3rd parties and regularly get blocked whilst waiting for the 3rd party to complete something. Unfortunately, the contracts with these 3rd parties do not provide enough leverage to get them to respond quicker so the team could only make them visible. Making them visible enabled senior management to see exactly who was blocking them and chase suppliers on a daily basis, applying pressure where possible. Any waste incurred by the team was captured, quantified, and stored in the waste envelope for discussion during retrospectives. All magenta post-it notes (blockers) are kept once the blockage has been removed. These blockers are then analysed during retrospectives to look for trends, common blockages, or any other intel to assist in improving the process. The team have stuck a paper based form to the right of the board so simplify the generation of a Cumulative Flow Diagram (CFD). They find it easier to write the card count for each column on the form and then update the electronic chart periodically – say at the end of each week. Each day a new card is inserted directly into the WIP column (a slot is reserved so as not to blow wip limit). Each day between 13:30 and 15:00 the team hit the Infra queues for their team and complete what they can within the time box. The number of completed jobs/tickets in infra is added to the card and its then placed in the done column. The number of jobs/tickets completed is added to the CFD done value.